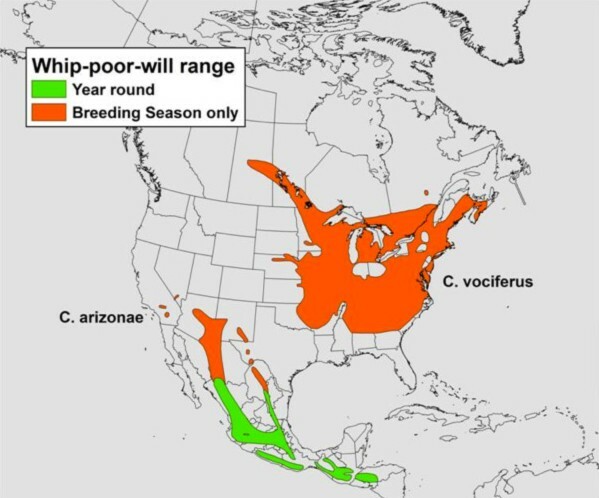 The Eastern and Mexican Whip-poor-wills (Caprimulgus vociferous and C. arizonae, respectively) were taxonomically split in 2010 based on their distinct geography, vocalizations, plumage, morphology and other characteristics. There has always been a long standing tradition of recognizing the eastern and Mexican Whip-poor-wills as unique populations but the recognition reminds us of having distinct monitoring and conservation measures in place. The Mexican whip-poor-will breeds throughout Mexico and in the Southwestern United States including western Texas, New Mexico, Arizona, California, and Nevada. In the U.S., the Mexican whip-poor-will is associated with high elevation pine-oak, pinyon juniper, and ponderosa pine forests. These habitats are generally found above 1,500 m altitude and are limited in distribution by the interaction of climate and elevation. The warmer temperatures found at lower elevations create a natural barrier to the down slope movement of these coniferous forest types. Climate change threatens to replace these high elevation habitats with those unsuitable for Mexican Whip-poor-wills. The reconfiguration of habitats predicted from climate change could likely result in dramatic population reductions for this species. The Nightjar Survey Network has been able to focus some of the monitoring effort specifically for Mexican Whip-poor-wills with the help of volunteers and biologists from the southwestern United States. We currently have 37 of the 147 nightjar survey routes in Arizona and New Mexico placed in the identifiable life zone for Mexican Whip-poor-wills and also have additional routes appropriately placed in other states. We will be supplementing any additional sampling effort with a spatially balanced location method while also contending with practical limitations such as road access and habitat cover. Mexican Whip-poor-wills were detected on four survey routes in Arizona and one route in California. Because the detection history of each individual bird is recorded by volunteers in one minute intervals, we are able to determine that Mexican Whip-poor-wills have a 96 % detection rate during any one minute interval of the total six minute counting period at a route stopping point. There is also an equal probability of detecting that same bird again in any subsequent minute of survey while at the same point. This relatively high level of detectability matches detection rates of Eastern Whip-poor-wills counted on other routes of the Nightjar Survey Network. Whip-poor-wills are boisterous birds and have been known to repeat their onomatopoetic call over 10,000 times during a full moon night. The special focus we are placing on monitoring Mexican Whip-poor-wills is only possible with the help we have received from southwest regional biologists, including Carol Beardmore of the Sonoran Joint Venture, Dave Kreuper of the U.S. Fish and Wildlife Service, Christopher Rustay of the Playa Lakes Joint Venture, and James Schroeder of the U.S. Forest Service. These folks have been instrumental in the continuing route selection process, organizing volunteers, and even conducting surveys. We also thank the many volunteers in Arizona such as Shawn Caroll, Janine McCabe, and Greg Clark, Elaine and Bob Hugh, Richard Inman, Tom Hildenbrandt, and Cathryn Wise and Sandra Remley in California (who identified a new location for Mexican Whip-poor-wills during a nightjar survey there) for adopting routes within focal areas of Mexican Whip-poor-wills that are often remote and relatively more difficult to access. Figure 1. 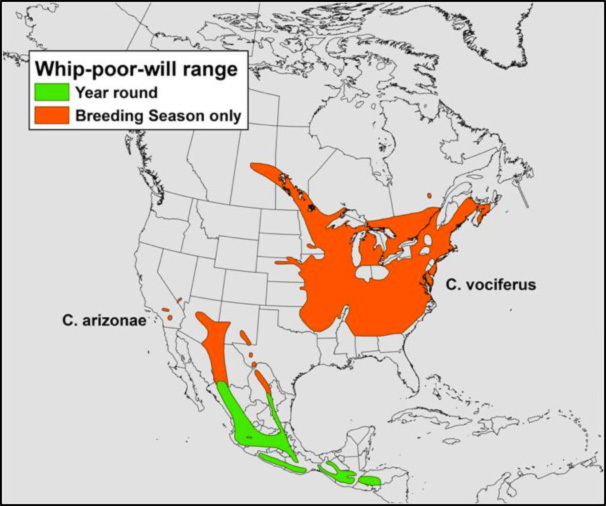 Breeding and year round distribution for the geographically isolated populations of the Mexican (Caprimulgus arizonae) and Eastern (C. vociferous) whip-poor-wills. Data from Natureserve. Figure 2. 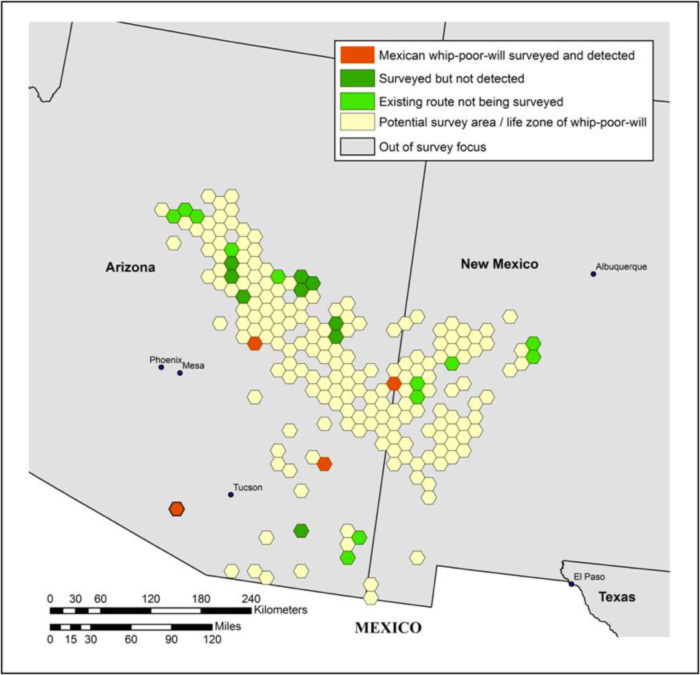 Focal survey area (as a hexagonal cell grid) of the Mexican whip-poor-will in Arizona and New Mexico. The Survey Network also contains routes in the high elevation life zone of this species in Nevada and California (not depicted).